around the landscape that attracts you by the prepared trails. You are sure to be charmed by the rich offer of experience available. The landscape will charm you by its picturesque rolling hills, its past and present, the renovated memories of human knowledge and skills. Just head towards Hřebeč and let the landscape surround you. Hugo, the mining dwarf, will be your guide. Click on his picture to find out more about him. However here on the internet, he will only tell you the most basic things. You will learn more from him on the paths. 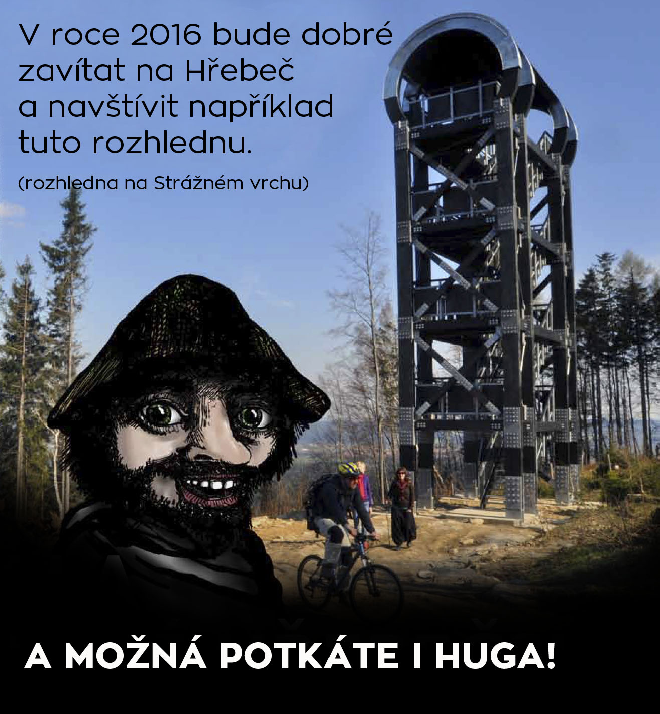 We wish you a happy journey to our region of Moravská Třebová. It might be you who will be walking towards the lookout towers, going from the arbour to the stop of the narrow-gauge railway, browsing through the geological exposition in the courtyard of the renaissance castle or, by climbing a rather high hill which – to a great surprise – has water ponds on it.